Scroll down for a great selection of Custom Pens. Each custom pen is imprinted with your text, logo or artwork! Custom Main Track Neon Click PenChoice of 5 colors! 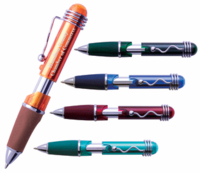 Classic Custom Imprinted PensFeatures a popular rubber grip. 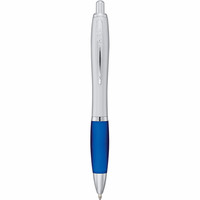 Oxford Mini Twist Custom PenFeatures a twist action and one-color imprint. 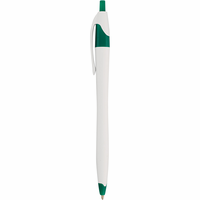 Scripto Scholar Click PenErgonomic tri-grip for comfort. Precision German black ink cartridge. Big Poppa (Ballpoint Pen)Pen includes click action mechanism and black ballpoint ink cartridge. Arabian Style Custom PenA fun pen that has loads of personality and is great as a giveaway or thank you gift. Eclipse PenBlot out your competition with the Eclipse! Hedge Laser Engraved Metal PensFeatures a smooth design and large imprint area! Cutter & Buck (TM) Ebony Pen SetA special gift for your important clients. 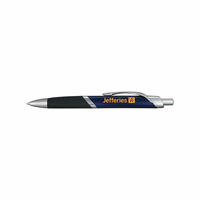 Here you can find a great selection of custom pens that can be branded with your logo or artwork. Click on an image above to see available colors and options. The personalized pens in the above sections make excellent giveaways for conferences, events and for branding your company. If you are looking to buy custom pens online, look no further! TrophyCentral has a great selection that will fit any budget. 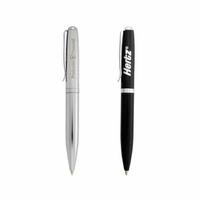 Our top-rated representatives are happy to assist you with all of your personalized pen needs. Our experts in New York and Michigan have been providing suggestions and guidance since 1999! 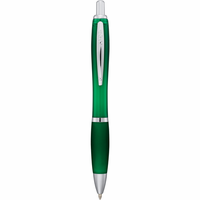 To find the perfect pen, click on an image above, or for personal service, call us toll-free at 1-888-809-8800.